Impressive. 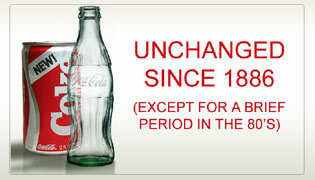 New Coke was one of the greatest blunders of the 20th century. Possibly in the history of bad corporate decisions, New Coke is at the top. Even those who weren't alive then have some passing knowledge of the complete idiocy of replacing a very good product that had an incredible market share and turning it a dumpster fire. Just how bad is Obamacare? It’s managed to supplant New Coke and the BP oil spill in the pantheon of public-relations disasters. Politico reports that communications firms around the country are now using the Obamacare rollout as a textbook case of how not to handle such a large PR disaster. For example, H + A International, a Chicago-based communications firm, sent its customers a 15-point analysis of the administration’s handling of the rollout; Boston-based CHT group released a guide titled “Obamacare and Health Insurance Exchanges: A PR Makeover,” critiquing the administration’s crisis management. I really can't overstate how bad the New Coke debacle was. If Obamacare is supplanting it, it could mean a bigger turnaround for the GOP than 1994. New Coke may not have been quite as bad as people remember but the perception the switch has created and the distance over time has created a legacy that pretty much has people believing that New Coke was actually malted battery acid and all the Coca-Cola executives were lobotomized spider-monkeys. In truth, New Coke actually was rebranded "Coke II" and lasted 6 years on the shelves. Now if Obamacare is creating a perception of THAT level of failure, a level I believe is quite a bit more accurate than the perception of failure of New Coke, then imagine what its legacy will be in 30 years. Let's face it, that our sugar water tasted a little different wasn't the end of our way life, but Obamacare certainly has far reaching consequences. How will the failure create a new mindset in this country? Could we start seeing a new, healthy, level of distrust in the government again? Assuming we can get it repealed, will it last as a warning to future generations not to mess with a tried and true formula, called free-market economics? If Coke could still be brought up as a poster child for failure in corporations, let's hope that Obamacare could be the poster child for failure in government.